It feels like ages since I have worn a polka dot dress, with Christmas in mind I decided to jazz this dress up with plenty of festive red! These photos were taken in our bedroom next to my dressing table (thanks for taking these photos Max), as you can probably see I look a little squashed in an attempt to get photos of the dress. I'll probably be getting a proper lighting set soon but it was nice to take a few photos in here as I really love how peaceful this room is and the lovely light! 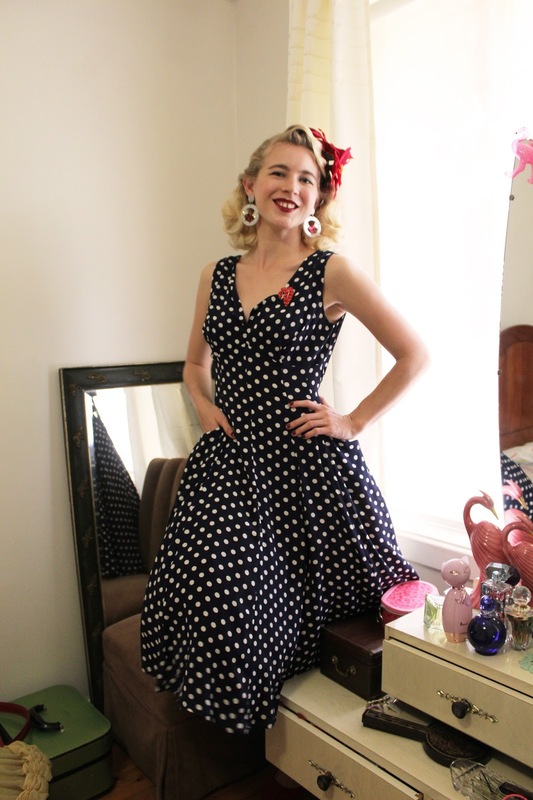 This dress set from Rock n Romance is gorgeous, I'm not always that into polka dots but I really love the cut of this dress, the rayon crepe de chine fabric and the fact that it is perfect for summer. The bolero is a great little addition, it may be a little too much polka dot for me all at once but I will be pairing the bolero with plain tops and dresses in the future. I am wearing size 10 as I have found that a lot of styles by The Seamstress of Bloomsbury run a bit small, mainly in the bust area. For this dress I think I could have sized down to 8 as I have extra room in the bust and waist but the dress has ties at the back which pulls in the waist. There are also cute front pockets and the back has a nice deep v which is nice and cooling during summer time. 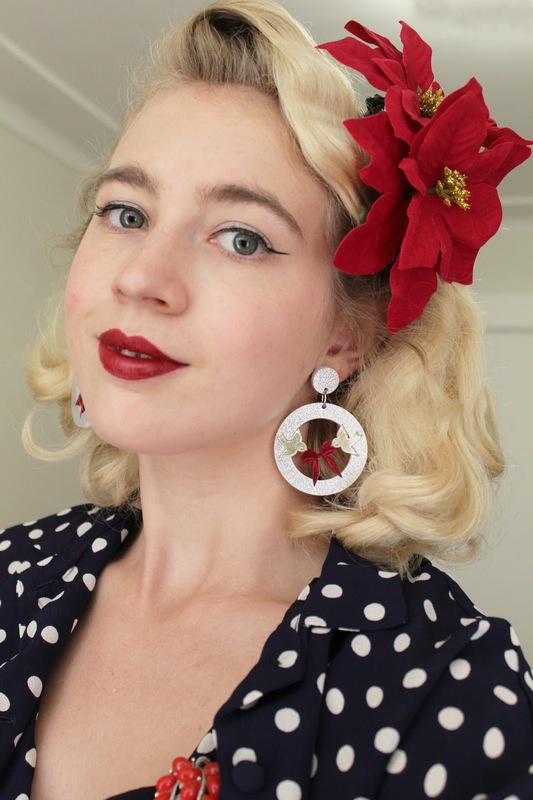 I've been wearing my Revere Folie Christmas earrings non stop this month and these hoops are just adorable, I'll be wearing them all year round too. 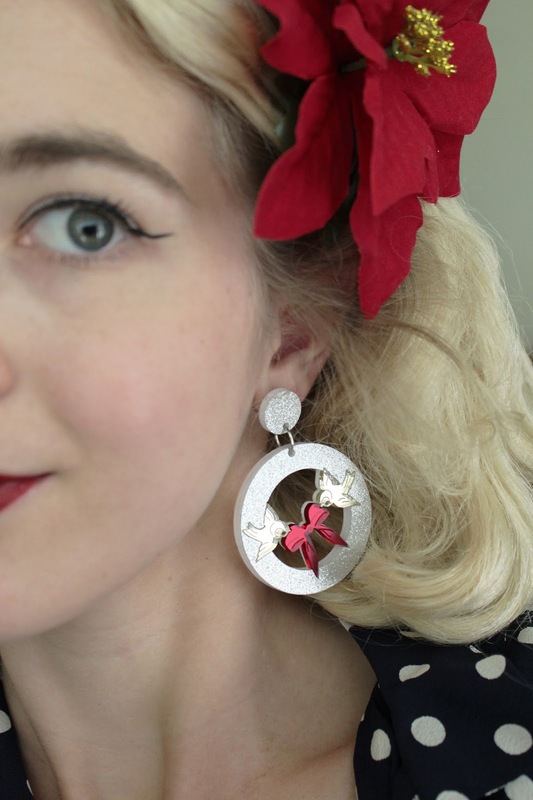 There's also a few days left to recieve a pair of limited edition snowflake earrings (when you spend a certain amout). I wear this brand all the time (as I'm sure that you can tell) and it's nice to support this lovely ladies small business... I can not recommend her designs enough! I'm going to apologise now in case I end up posting a bunch of festive outfits all in a matter of time as I have a few lined up that I really want to post soon... It is also my birthday in just over a week so I want to put some of my birthday outfits up before Christmas! I love this look! The little bolero really makes the outfit look polished and eleven to. Ooh, and the red accents are so gloriously festive!!! Love this look! 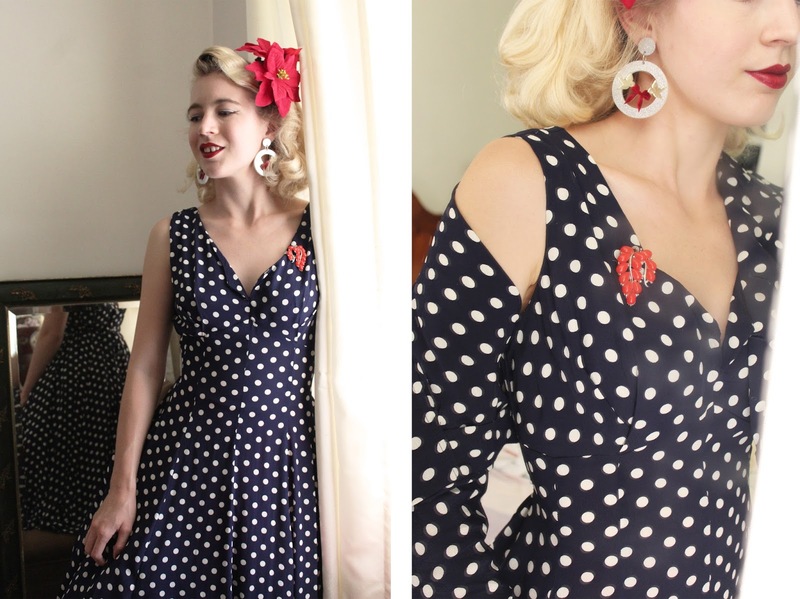 Polkadot dresses are my favorite! That matching bolero simply finishes the whole outfit!